Hole depth, tolerance, and location will determine the type of drill needed. Many many variables must be considered before selecting a hole making tool. 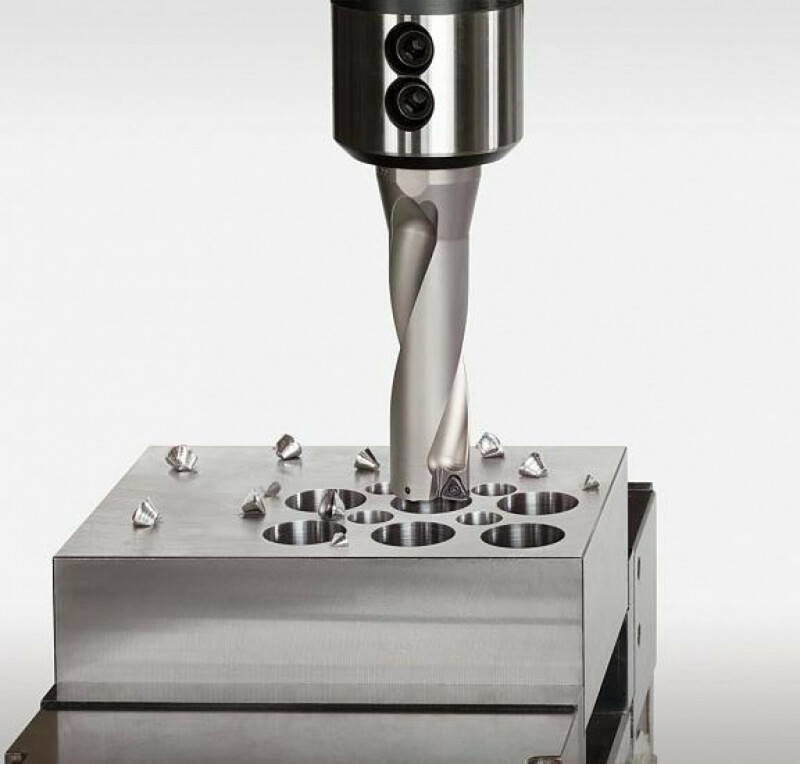 Drilling a hole may seem like a simple machining operation, but many variables must be considered before selecting a tool for holemaking. The following five variables are among the most important. The diameter-to-length (D:L) ratio is one of the first things to consider when selecting a tool to produce a hole. The shorter the drill, the easier it is to produce the hole. When a drill has a long D:L ratio, special care must be taken to avoid drill runout, chatter, poor surface finish, and out-of-tolerance holes. Chip evacuation is essential in all drilling applications, but is extremely important during high-D:L drilling. To help ensure good chip evacuation, adequate coolant pressure should be applied. The longer the D:L ratio, the more coolant pressure is needed. For example, a drill with a 1.5-to-1 D:L should have a minimum of 75 PSI applied through the centre of the tool, while a drill with an 8-to-1 D:L requires a minimum of 220 PSI applied through the centre of the tool. When drilling D:L ratios of 5-to-1 or greater, it is often a good idea to use a pre-drilled pilot hole. When a pilot hole is required, the long drill should enter the pilot hole at a slow RPM and feed rate. The long drill should dwell inside the pilot hole for two to three seconds and then the coolant should be turned on. At this time the long drill can continue at the recommended speed and feed. Hole tolerance is a key consideration when selecting a drill. If the hole tolerance is high or if the hole will be bored or reamed after the drilling operation, an indexable insert drill can be used. These indexable insert drills typically have two inserts. One insert is centre cutting while the other insert cuts the diameter of the hole. Because only one insert is cutting the hole diameter, the drill has a programmed feed rate as one effective tooth. These drills are slower than replaceable-point-type drills because the replaceable-tip drill has two effective teeth, thereby feeding twice as fast as the indexable insert type. The repeatability of indexable insert drills often is at the mercy of the insert tolerance and the pocket tolerance of the tool, so they are typically not as accurate as replaceable-tip drills. However, indexable insert drills offer great economy because the indexable insert is a fraction of the price of a replaceable-tip drill or solid-carbide drill and often offers multiple cutting edges. One often overlooked consideration in holemaking is how the drill is held. In the case of a rotating tool, the runout of the adapter and spindle will be a major factor in creating a quality hole. One common error is to hold a high-precision drill in a screw-down end mill holder. The end mill holder must have enough clearance for the drill to enter the adapter, and then the screws used to secure the drill push the drill to one side, causing a significant amount of tool runout. It is recommended that drills be held in a mill chuck or more accurate adapter. When you are running a drill on a lathe, it is critical that the drill point is on the centre of part. Often this is where setup ends; however, the drill still could be out of spec. The drill point may be on the centre of the part, but the centreline of the drill may not be parallel to the centreline of the machine. Care should be taken to ensure the centreline of both the machine and drill are the same. Many machinists opt to centre-drill a part before drilling, and although their intentions might be good, the centre drill usually does more harm than good. 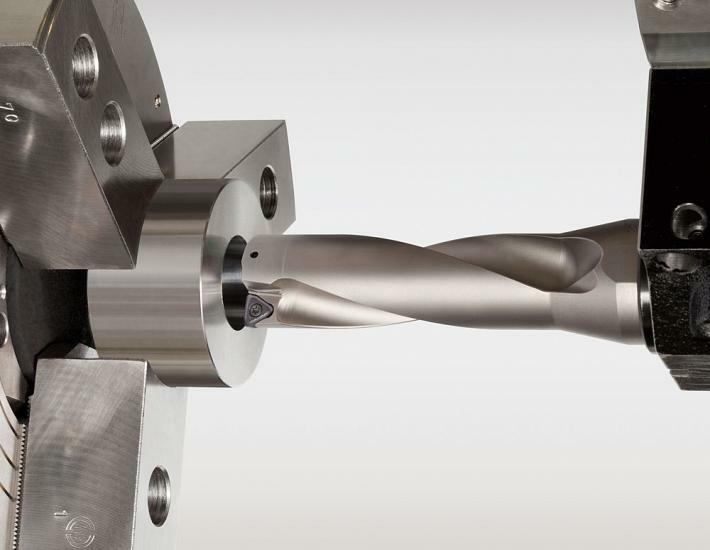 When the point of a replaceable-tip drill is used to enter the part, the cutting forces of the drill are balanced, and the drills are self-centring. When a replaceable-tip drill enters a part that has been centre-drilled, the angle of the centre drill does not match the angle of the drill and the point of the replaceable-tip drill does not make contact initially. The centre drill therefore causes the cutting forces to be off-balance. The result is vibration, poor surface finish, poor straightness, excessive wear, and out-of-tolerance holes. Centre drilling is not recommended for replaceable-tip drills. The surface of the part where the drill is to enter is another key variable. As mentioned, a replaceable-tip drill uses balanced cutting forces to direct the drill. It is best to enter a smooth, FLAT SURFACE to create balanced forces. When a replaceable-tip drill enters a CONVEX-SHAPED PART, the radius of the dome should be at least four times larger than the diameter of the drill. When replaceable-tip drills are used in a steeper dome of less than four times the diameter of the drill, spot facing the part to create a flat surface is recommended. A CONCAVE SURFACE may be machined provided drilling occurs at the centre of the concave area, the drill axis is perpendicular to the machined surface, and the radius is more than one times larger than the drill diameter. Otherwise, it is recommended that the surface be spot-faced to provide a flat surface. When you are drilling an INCLINED SURFACE, a replaceable-tip drill can enter the surface provided the surface is at 7 degrees or less. If the inclined surface is more than 7 degrees, spot facing is recommended. Exiting an inclined surface also can cause problems because changing the balanced cutting forces can push the drill off to one side, damaging to the drill and the part. Again, if the location of the exit hole is inclined 7 degrees or less, simply drilling straight through will suffice. However, if the exit hole is on an inclined angle that is greater than 7 degrees, it is recommended that the exit location is spot-faced to provide a balanced exit. ASYMMETRICALLY CURVED SURFACES should not be drilled without first creating a flat surface. Even the surface finish of a flat part should be considered. Surfaces rougher than Rz32 should be spot faced before drilling. Drilling STACKED PLATES also is possible using replaceable-tip drills, provided the workpieces are rigidly clamped and there are no gaps between the plates. Of course, it is recommended that you use ample amounts of coolant at high pressure because coolant both ejects the chip and cools the cutting edge. But not all machines have through-the-spindle coolant. Where coolant-through is not available, a coolant inducer should be used. In the event coolant-through is not available, and a coolant inducer is not practical, replaceable-tip drills are available that can drill up to a depth three times the drills diameter using an external flood coolant. In this case, RPMs should be reduced, lessening the heat at the cutting edge. Care also should be taken to ensure chip packing does not occur. When drilling with external coolant, use a spiral flute drill to help evacuate the chip. Although pecking cycles are not recommended to optimize the replaceable-tip drill, sometimes they are necessary. When the machine has ample coolant supply and pressure but the material being cutting is malleable and its hard to break the chip, drilling to a predetermined depth and retracting in the Z axis by only 0.012 in. and then proceeding to the next predetermined depth and repeating is recommended. This method allows the chip to break and provides better chip formation, preventing or at least reducing chip packing. If coolant is supplied externally or coolant pressure is poor, drilling to a predetermined depth and then extracting the drill almost entirely from the hole, ensuring the head of the drill remains in the hole by 0.118 to 0.197 in. until the last drilling cycle, is recommended.